Can a family of 5 big eaters eat real food for $90/week? If you are passionate about healthy eating but need to save serious money, this series is for you. Learn how to eat real food cheap! For the most part, we were content. But every now and then something would happen that reminded me of just how tight things were. My sister had visited weeks before and given me a $10 gift card to a department store. Procrastinator that I am, I didn’t watch the expiration date. Besides, it was one of those stores that sell jewelry and purses well over $10, and we were more concerned about food and housing. However, the day before the coupon expired, I decided to pop into the store. I was pregnant with our first child and I was outgrowing all of our clothes. I had an hour to kill, waiting for Chris to get off work. When Chris found me at the store, I was in tears. Nothing I needed was under $10, and tomorrow this free money would be gone. I was holding a pair of earrings that I kind of liked, but I knew that tomorrow my shirt would still have holes and my pregnant stomach would not stop growing. It felt like such a waste of a precious $10. I felt stupid, hormonal, and very first world. It wasn’t really about the gift card. 2 years before, I had lived in the poorest country in the world. I knew what starvation and disease looked like. I knew that we had all we needed, really. We had health insurance and a vehicle to share. We had a roof to rent, a laundromat across town, and despite the tiny holes in my shirt and that our eating out involved a $1 burger from Sonic, we never needed to wonder if our bills were getting paid. Sure it was tight. But we had all we needed. Maybe you’re there right now too. Maybe you are barely making ends meet, and you see everyone else buying jewelry and purses, and it’s not that you want that purse, but you just want to be able to stop stressing. Or maybe you’re trying to pay off debt. You’re on Baby Step 2, and you know that debt could go away forever if you could just get your act together and pay it already. Or maybe you have a dream you’re working towards. Years after the earrings left me sobbing at the department store, we weren’t in survival mode. We weren’t rolling in cash, but we had some choices to make. We had dreams we knew would require saving a lot of money. There’s a squirmy tension between saving money and eating healthy. If you care about your body or the bodies of the people eating at your table, you don’t want to fill them with junk in the name of saving money. But if you are desperately trying to save money, you can’t afford to be trendy, no matter how smart it sounds to eat local kale, grassfed meat, and free-range organic eggs. Hopefully, that is a goal you will reach someday. But in this season, it needs to wait. 10 years ago, Chris and I started with $25 a week for groceries, and we were committed to eating as healthy as possible. As our family, income, and experience grew, we increased our budget incrementally. We wanted to nurture our bodies, but we also needed to leave margin for saving. 80/20 rule – 80% of what we eat is good and mostly nourishing. 20% is pizza and cake at birthday parties, cold cereal, homemade chocolate chips cookies, etc. We try to do this while sticking to around the amount our family would receive on full SNAP (food stamp) benefits. This works out to around $150 a week. For some people, feeding 5 people with the above guidelines sounds impossibly low. For others, $150 a week – regardless of guidelines – is way too much. While trying to save money and eat healthy in the last year, our family has tried a few experiments, or challenges. Honestly, we experiment like this constantly. I enjoy finding new ways to nourish our bodies frugally. We’ve done plant-based, paleo, fitness-fueled challenges, and more. #RealFoodCheap is our next one. The goal will be to see how cheaply our family of 5 can eat without worrying about special labels – no organic, grass-fed, non-GMO, local, etc. – just eating generally good whole foods from whichever source is most inexpensive. The truth is that is where a lot of us sit. We can’t afford to get trendy about food right now – as good, ethical, and fun as that is. We just need to eat whole food, and we need to do it cheaply. I will share weekly updates here, but I will also post to Instagram and Facebook throughout the week with the hashtag #RealFoodCheap. 80/20 rule – 80% of what we eat is good and mostly nourishing. 20% is pizza and cake at birthday parties, cold cereal, etc. We will try to follow these guidelines while sticking to a grocery budget of $90 a week. When I asked for input on Instagram, the Cheapskate Cooks List, and the Cheapskate Cooks Facebook Group, Most people agreed that $100-$125 a week is reasonable for a family of 5 big eaters. Since #RealFoodCheap is about trying to save the most amount of money while eating well, I decided to try $90 a week. If you are paying off debt or trying to make ends meet, $90 is probably more realistic. I know it has been for us. I’ll be honest. I’m nervous. I know I can stick to $90, but I’m a little worried about getting enough fruits and vegetables and using only natural sweeteners. Also about feeding kids who already eat like they have tapeworms. My main goal is to encourage you (well, and to save money). If you are trying to eat healthy, but you have to make some compromises in order to provide for your family in other ways, that’s okay. You are doing a good job. Let’s do this together. Got any tips to help us stay under budget? Share them in the comments below! I’m excited to see what meals you feed your family during this challenge! Our grocery budget can range from $300-$500 per month for our family of 4 (myself, my husband, and our two boys, age 10 and 13). For October, our food budget is $300. The best tip I could give when sticking to a small food budget is to shop less often. 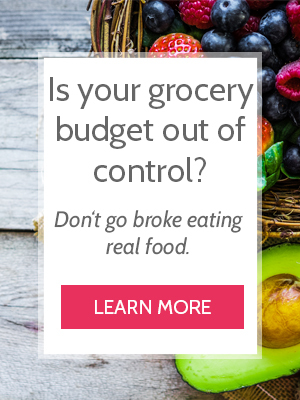 I will only go to the grocery store twice during months that our food budget is under $400. This allows me to buy the bulk of our food at the beginning of the month and then replenish our perishables the last half of the month. I ONLY buy meat and produce at its lowest prices and only about 70% of our meals have meat in them. Some other things that help me stay under budget- I buy bread at the bakery outlet or I make it homemade. We eat a lot of air-popped popcorn, hardboiled eggs, and fruit as snacks. We eat homemade granola, whole grain waffles and pancakes, and toast and eggs for breakfast. We pack leftovers for our lunches. I work full time outside the home and my kids are in evening activities a few nights per week, so I have to very diligent in order to make sure a healthy meal gets on the table each night. I ALWAYS have a plan for dinner. On the nights that everything goes crazy, I give myself grace and we eat scrambled eggs and fruit. Love your game plan, Leslie. Way to go! You’re doing amazing. In my experience, Sam’s is cheaper than Costco. Way better quality and price on American Beef. If there are gluten problems, stick with organic wheat products, commercially processed wheat products in the US are processed by spraying the entire wheat field with Round up so what you are actually experiencing is Glyphosphate Poisoning and Genetically Modified Organisms, pay attention to those because they are genetically modified to produce profit, not healthy people. The gut is important to overall health because that is the seat of immunity in the body. If you don’t have a healthy gut eventually you will be subject to every bacteria and autoimmune disease out there which is VERY expensive. Go back to your Whole 30 and re-read the section on Gut health. If you are talking about teenagers, get another refrigerator and stand up freezer, for the garage and shop once a month.